The founders of quirky nightspots Barts and Maggie's on the speakeasy culture, supporting local businesses, and their latest venture, the wackily named Bunga Bunga. 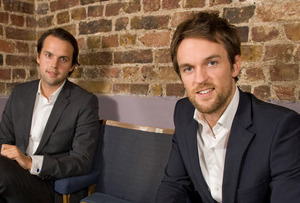 Young entrepreneurs Charlie Gilkes and Duncan Stirling have made a name for themselves in the fiercely competitive nightlife industry by launching novelty bars and clubs with real staying power. MT caught up with the pair at the Inception Group South London headquarters above Bunga Bunga. Here's how they did it. MT: Were you friends before you became business partners? Charlie: The opposite, actually. We both worked in promotions. Duncan had a successful events business and I ran a few nights while studying at Edinburgh University. We met because we were both accidentally double-booked for the same night. Rather than fight it out, we decided to team up. It was the best night we’d ever put on. Duncan: We managed to convince tthe Sloane Square Hotel to let us open a joint venture in its basement. It was planning to convert the downstairs into a maintenance office and housekeeping closet but it had a great late licence. We told them they were crazy and produced a budget and forecast for opening it as a club. We got the management contract and opened Kitt’s in 2006. We managed it for three years and then decided to go our own way. You wanted to open your own place? Charlie: That’s right. Kitt’s was great but we still had to answer to the hotel and we couldn’t open up a rival bar or club while under contract. We’d been spending a lot of time in New York, checking out the speakeasy culture - a hotdog stand that doubled up as a travelling club; a bar with a secret entrance in a phone booth. We wanted to bring the spirit of the speakeasy to London. Did you find a likely looking phone box? Duncan: No. But we did find an empty spot in the Chelsea Cloisters building. We created a secret door and did it up on a shoestring. Barts has been going for three years now. On a shoestring? In Chelsea? Charlie: Well, Northern Rock had just happened. Ostentatious, champagne-spraying nightlife was on its way out. We wanted an unpretentious, affordable drinking hole, built with the recession in mind. But you didn’t just open a network of unpretentious bars? Charlie: No. Our next project was Maggie’s in Fulham. The idea is always to rebel against what is popular at the time. Tiki bars and Moroccan Fez-style places had been done to death and we wanted something quirky. We settled on the eighties theme: staff in Top Gun uniforms, Rubik's cubes, cocktails with umbrellas. Margaret Thatcher was Prime Minister from 1979 to 1990, she very much captured the spirit of the eighties, hence Maggie's. Aren’t you somewhat alienating the anti-Thatcher contingent? Duncan: Politics is the most divisive thing. We may play Maggie’s speeches in the toilets but there are plenty of anti Poll Tax posters around. It’s not some Tory club. Which brings us to Bunga Bunga. Where did the idea come from? Charlie: There used to be three parts to a night out. You’d go to a bar, then a restaurant, and finally the theatre or a club. We wanted to make a one-stop-shop venue with a bar, food and a show. Isn’t it bad for business that Berlusconi was given the heave-ho last year? Charlie: Not at all. Over 50% of people that walk in the door don’t know the connotations of the name. They just know it sounds fun. How did your neighbours react to a late-night club opening up next door? Charlie: We threw a big party for local residents when we first opened, just to let them know who we are. And we made sure that we used local businesses when we were doing the place up. We’ve spent thousands at the picture-framers over the road. And even the Pizza Express opposite has reported a 30% increase in business, despite the fact we do pizzas too. We’ve created a night-life destination! Duncan: It wasn’t. We have no investors so it’s our own money on the line when we open a new site. Things inevitably go over time and over budget. And our business model is inherently risky. All of our venues are on hugely failed sites. That’s what we do, we find the right postcode, the right licence, not necessarily the right street, and try and make it work. And hiring the right staff is always an issue. So what’s next for Inception? Duncan: There’s still a lot we want to do with our existing venues but we do have itchy feet. It’s time for site number four. We have three or four concepts that are good to go, but they are all rather site specific. Charlie: Or we could roll out more Bunga Bunga venues in other parts of London too. Ultimately, we want to do a hotel. We’re not quite ready for that yet, though. You think that a Bunga Bunga chain would work?